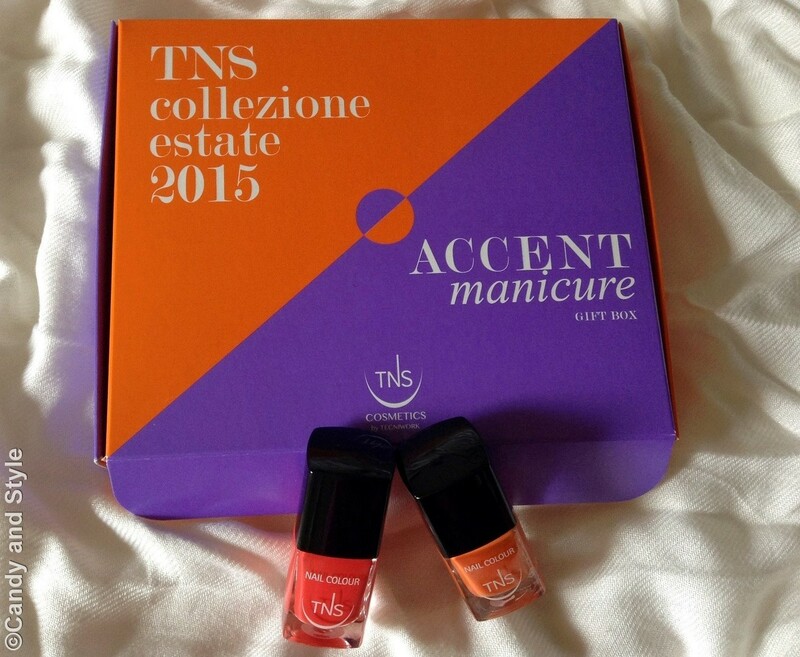 Let's go back to talk about TNS Cosmetics, the Italian brand leader in the professional cosmetics for manicure and pedicure, that I've recently featured in a previous post for the launch of their exclusive makeup collection (if you are still not familiar with the brand check out also this post). 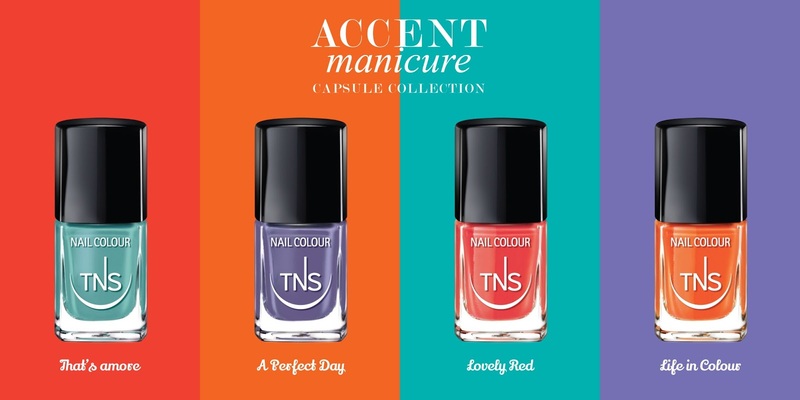 Accent Manicure is the new limited edition for the summer: four vibrant shades of nail lacquers (tiffany blue, periwinkle, red and orange: That's amore, A Perfect Day, Lovely Red and Life in Colour), to mix and apply together for bright colors combinations, or just alone for cheerful mani and pedi. 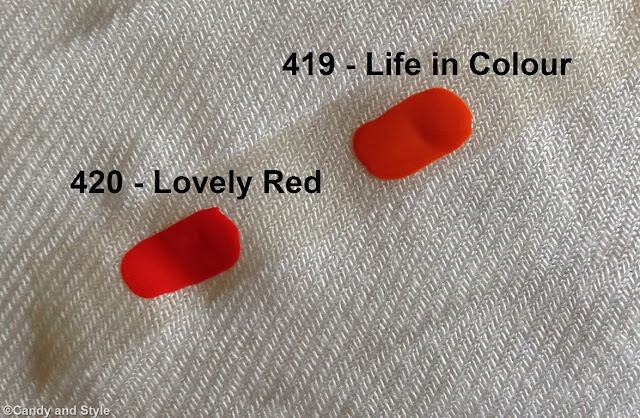 I chose Lovely Red and Life in Colour: the first is a vivid red with an orange undertone; the second is an intense orange with warm hues. Both are ideal for summer being so light and bright, are also very quick to apply thanks to the flat brush, my favorite ever. The texture is thick, fast to dry, long lasting and easy to remove; I have on Lovely Red from Friday evening and is still flawless. Most important, the formula is very safe being 3-Free: Formaldehyde, Toluene and Phthalate free, as in all the TNS nail lacquers. 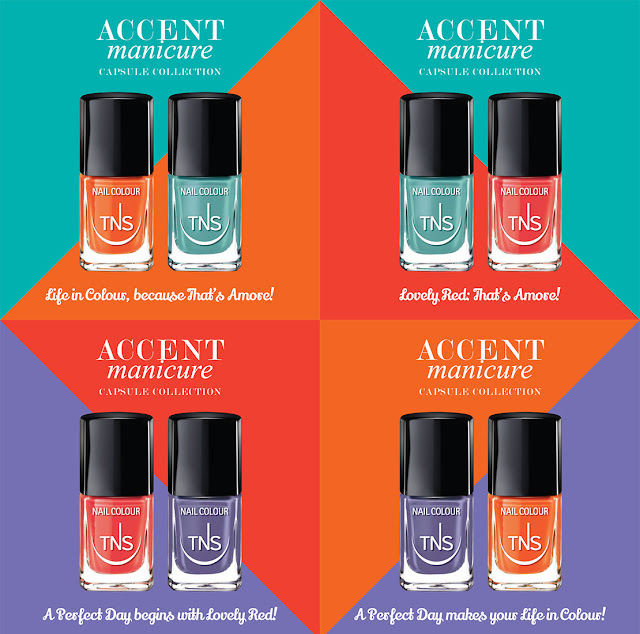 How do you like the Accent Manicure collection? Which colors combo would you prefer? ITALIAN READERS: I prodotti TNS Cosmestics si trovano in vendita negli Istituti di Bellezza. Per qualsiasi altra informazione potete consultare la pagina facebook. Sebbene io sia per il classico rosso per cio che concerne la manicure devo dire che il verde mente non mi dispiace per nulla..
Hey Lilli, I remember the last post about TNS Cosmetics! 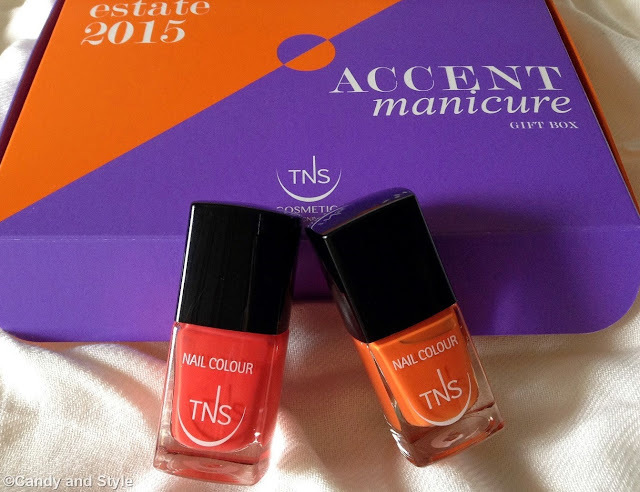 I really like the Accent Manicure collection from what I see. I'd have chosen those shades too, as they are really cool, but also the tiffany blue and periwinkle aren't bad at all! I will search for them if I happen to be in Italy soon! I saw the latest outfit on your blog - such a cool pair of sunglasses! And the top knot haistyle is a great idea for the weekend! Hope yours was nice and relaxed! About the wedge sandals - I like them! But I have doubts that they will look ok on my feet. Otherwise the ones from Topshop are even nicer! Good morning Lilli! I hope you had a wonderful weekend! These are such beautiful colors to wake up to. They already brighten my day! Have a great week Lilli ,lovely Greets! This is a nice brand Lilli. The box and packaging are amazing. Love both colours. I will use them right away. These are some awesome colours for summer! I hope they ship to Greece! Che bella collezione, mi piacciono queste nuances! I love the orange shade and how much does the packaging look like Chanel! conosco questa azienda e fa veramente dei bellissimi prodotti, gli smalti sono bellissimi!! Lovely colors, they look really good <3 many kisses dear Lilli!!! Li trovo perfetti per l'estate! Saràche è il periodo dell'anno in cui mi piace osareun pò di più! sono bellissimi questi colori....perfetti insieme!!!!!! The shades you chose are so pretty and so you LillI! Bold, brights are always a good bet for the summer and I bet these will look just lovely on you. The formulation sounds great as well. Have a wonderful week my dear! ...splendidi colori perfetti per la bella stagione...a me piace tanto anche il tiffany!! !...e poi sono smalti di ottima qualità!!! Ho una passione per il colore rosso, molto bella questa tonalità! con l'abbronzatura poi devono risaltare ancora di più! 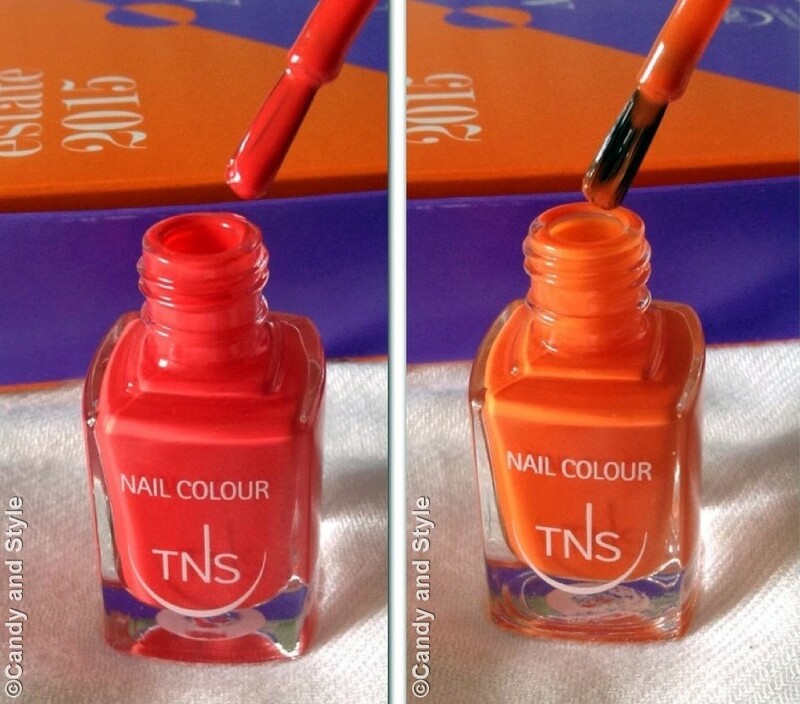 Dear Lilli, I still remember the other post about TNS Coametics and I like the color befor. The colors today are also great. I really like red and orange for feet and manicure,,especially in the summer. I'm sure you will wear both colors very often. Thank you for including these Italien brand. Lilli, those are the colors I would've chose. So pretty and perfect for Summer. Great review Lilli...thx for sharing! These are all so gorgeous! So nice that you got to try these nail varnishes. The colours look perfect for summer. Ma che belli questi colori Lilli, perfetti per l'estate!! Ohhh, both shades are gorgeous Lilli but obviously my favourite is Lovely Red. LOL! I think the formula of these nail polish sounds fabulous, I mean 3-Free, quick drying and long lasting? That's just perfect! These are gorgeous!!! I would love to try Life in Colour, seeing as I already own a lot of red nail polishes. Such great post!! Ciao Lilli. A me piacciono tutti i colori di questa mini collezione. L'arancione è bellissimo. Ma che belli i colori di questi smalti, sarei curiosa di provarli! Love the earthy vibe of the color collection! sono proprio carine queste tonalità...tutte e due! Lili io ho appena preso uno smalto arancio e sono veramente curiosa di provarlo!!! da quando me li hai fatti conoscere sto usando solo questi smalti, perché sono professionali, durano a lungo e non devi star li a togliere e a mettere come mi succede con gli altri smalti. gli adoro!! !